To ask other readers questions about The Discovery of France, please sign up. This isn't an armchair travel book, it's an armchair time travel book. The use of the singular in the title is potentially misleading. It is the result of the author's discovery of France on bicycle and in the archives (but not both at the same time I hasten to add to reassure any anxious library lovers). It is also a book about how many times and how many ways France has been discovered. So we have the two men who tried to discover the boundary between the Langue d'Oc and the Langue d'Oil, one d This isn't an armchair travel book, it's an armchair time travel book. The use of the singular in the title is potentially misleading. It is the result of the author's discovery of France on bicycle and in the archives (but not both at the same time I hasten to add to reassure any anxious library lovers). It is also a book about how many times and how many ways France has been discovered. So we have the two men who tried to discover the boundary between the Langue d'Oc and the Langue d'Oil, one died and the other lost an eye in the process (I'm not sure if the discovery of the Benrather line was quite so dangerous). We have the explorers of caves and caverns, Cassini's mapmakers (one of whom is murdered while surveying in the first pages of the book), the first tourists and the sudden attention of the Parisian anthropologists to the supposedly backwards and primitive types to be found in the countryside, though to their chagrin they found that Breton skulls were larger than supposedly superior Parisian types. Then there are other discoveries. The discovery of the world beyond their villages made by generations of migrant workers who spent years working in different cities with people from particular areas dominating certain trades, and the discovery of a notion of being French thanks to universal education, mass literacy and the bicycle. The most profound discovery is that of the pre-modern ways of life that existed. A town's bread baked once a week, or harder yet all the year's baking done at once with the hard loaves softened in water, milk or wine throughout the year. People living a subsistence lifestyle slowing down into a semi hibernation during the winter months, the lives of those for whom going barefoot was a more sensible way of crossing fields than wearing shoes or the stilt wearing shepherds whose way of life disappeared with the coming of modernity. Tying the book together is the discovery of long standing prejudices. The book opens with the still mysterious persecution of the Cargots and ends with that of people of North African descent stuck in high rise suburbs. Discovery of France charts the transition of the region covered by modern France into the unified cultural/political/geographic entity of today. This is incredibly interesting because from our perspective, we have forgotten (if we ever knew) what went into the process of taking the thousands of villages and regions differing in all sorts of ways, and crushing them into the relatively homogeneous high-tech culture of today - unifying languages, political systems, forms of transportation, religion Discovery of France charts the transition of the region covered by modern France into the unified cultural/political/geographic entity of today. This is incredibly interesting because from our perspective, we have forgotten (if we ever knew) what went into the process of taking the thousands of villages and regions differing in all sorts of ways, and crushing them into the relatively homogeneous high-tech culture of today - unifying languages, political systems, forms of transportation, religion, and so on. A theme throughout is Scott's legibility (Seeing Like A State); Robb gives all sorts of examples demonstrating local knowledge, specialized information, and resistance to outsiders. Where do I start... The extraordinary fact that until the 20th century, French was only a plurality language in France? The stiltwalking shepherds? The horrifying bits about drunken dying babies being carted to Paris by the 'angel-makers'? The packs of smuggler dogs who smuggled goods in and out of France for their human masters? (Or the dog-powered factories?) The forgotten persecution of the cagot caste? The Parisian who sold maggots to fisherman, which he raised in his closet on a pile of cat & dog roadkill collected from the streets? The wars between rival villages? The commuting peasants who thought nothing of a 50 mile walk? The strange twists of fate that lead regions to specialize in particular wares? The villages of cretins or families who regard a cretinous child as a gift from god? The mapping of the hidden communication networks that spread rumor at the speed of a horse? The corvée system of road-building, so inefficient at points that transporting the materials to build 1 more meter of a road could destroy more than 1 meter of that same road? All of this and much more is to be found in Robb's dizzying tour of France, past and present, a tour I found as entertaining as educational. Francophile that I am, I will never see France quite the same way after having read Robb's fascinating historical geography (or geographical history)of France up to WWI. Almost every page, in fact, almost every paragraph proves chock-full of interesting "facts" and authorial observations. There are chapters on languages (French having been a minority, i.e., "foreign" language a mere hundred years ago); animals (the "60 million Others" who also inhabited the Hexagon); maps, roads, travel in all i Francophile that I am, I will never see France quite the same way after having read Robb's fascinating historical geography (or geographical history)of France up to WWI. Almost every page, in fact, almost every paragraph proves chock-full of interesting "facts" and authorial observations. There are chapters on languages (French having been a minority, i.e., "foreign" language a mere hundred years ago); animals (the "60 million Others" who also inhabited the Hexagon); maps, roads, travel in all its dimensions, "colonization" of the nation, tourism and more. I am already rereading this book with a map of France spread out on the dining room table in front of me as I do so (bearing in mind that to "find" all the locales Robb references really requires a palimpsest of old and new, large and small scale, linguistic, ethnographic & topographic maps, some of which may not even exist. My deep love for France and the French is not based on deGaulle's France as a great nation but rather on its profound diversity of its language, culture, cuisine and mode de vie. Every region, every village, is unique because of its soil, what it grows, the history of its people. While the blender of globalization has been homogenizing culture in larger cities, one can still find villages that build the Feu de St. Jean at midsummer and watch the young men leap over the flames. Ancient dances, re My deep love for France and the French is not based on deGaulle's France as a great nation but rather on its profound diversity of its language, culture, cuisine and mode de vie. Every region, every village, is unique because of its soil, what it grows, the history of its people. While the blender of globalization has been homogenizing culture in larger cities, one can still find villages that build the Feu de St. Jean at midsummer and watch the young men leap over the flames. Ancient dances, regional costumes and traditional dishes have not yet been forgotten. Robb has given a depth of understanding to the people of France in historical and geographic context. He introduces old languages, transportation routes and customs borne of economic and religious necessity. How ancient pagan spirits were transformed into local saints was especially fascinating. In Plestin-les-Greves, a town in Brittany where I have spent considerable time, we had always wondered about St. Efflam, whose primitive likeness adorns a tiny local chapel in the woods (or "coat," in the local Breton language). Reportedly, Efflam left his wife on their wedding day to become a priest. He is not a Church-sanctioned saint but more on the order of a local saint, as is the case in rural areas across France. This is a fascinating book, full of the perfectly unexpected. It is possibly the best piece of social history I've ever read. The accepted version of modern French history relies on a linear story of gradual and natural centralisation: the organic creation of a nation conceived of, in its essential form several hundreds of years ago, and striving ever since towards its own self-realisation. Robb overturns this view and demonstrates again and again that it is a miracle that modern France ever cam This is a fascinating book, full of the perfectly unexpected. It is possibly the best piece of social history I've ever read. The accepted version of modern French history relies on a linear story of gradual and natural centralisation: the organic creation of a nation conceived of, in its essential form several hundreds of years ago, and striving ever since towards its own self-realisation. Robb overturns this view and demonstrates again and again that it is a miracle that modern France ever came into existence at all. Little more than a hundred and fifty years ago, the vast majority of the 'French' were quite unaware that they were French at all, did not speak the French language and had never travelled outside their region. The latter is hardly unusual, but when one adds to this the fact that large areas of France remained unmapped, and completely unknown to outside eyes, until the mid-nineteenth century; that official knowledge of some regions did not extend fifty metres from the side of the main coach road; and that travel of any kind was tortuously slow and uncomfortable, we can start to see the French state as a rather more modern invention than we would ever have supposed. Indeed, it would be fair to say that it didn't really begin to emerge in a recognisable form until the educational and other reforms of the Third Republic, in the 1870s. Robb treats his subject in themed chapters which are not straightforwardly arranged in an overarching chronology, although that chronology does frame the book as a whole (and the contemporary conclusion provides a fitting point of departure for further investigation). Unlike other 'themed' histories (I'm thinking particularly of Peter Ackroyd's long, dry 'biography' of London, which often reads like an unedited, self-indulgent list of lists) Robb's succeeds in giving life to the many dimensions of his subject, in order that we might start to view it more convincingly as a whole. He considers the many cultural, social and technological changes that might be thought of as central to a history such as this - innovations in cartography and in transport, regional identities, linguistic and topographical diversity, and so on. But he is also keen to reclaim those dimensions that often pass out of the record, the historiographical gaps and silences: in a chapter describing the passage of the year in pre-mechanised rural France, he asks his modern readers to try and comprehend the inactivity that dominated more than half of the agricultural year. How, he wonders, can history-writing describe the sheer boredom of these months? To eke out provisions between the reaping of one harvest and the sowing of the next, ordinary people would, more or less literally, hibernate, and the countryside would fall quiet throughout the whole of winter, but nowhere in existing literature is this really adequately described. In his desire to make tangible the pace of actual life, Robb evokes both Henri Lefebvre and E.P. Thompson, whose 'Making of the English Working Class' sometimes seems to be a template for this book (and who also famously concentrated on the birth of modern conceptions of time). Three point five stars, really, because I have the same sort of love/irritation with this book that Robb himself seems to feel for France. This is not a traditional history--it's not the story of grand men doing great and terrible things, thinking new and surprising thoughts, or inventing the Culture of the West that France, in large part, created from the 17th century onward. In some ways, it's a folk history, told through the small places in the heart of la France profonde. As such, it's a nece Three point five stars, really, because I have the same sort of love/irritation with this book that Robb himself seems to feel for France. In some ways, it's a folk history, told through the small places in the heart of la France profonde. As such, it's a necessary and timely work. But often, Robb makes sweeping statements, which seem unsupported by the text (despite extensive, erudite notes and a full bibliography). He tends to let one example, one incident, speak for too much he is trying to explain ... which bends history as much as concentrating only on, say, Louis XIV or Napoleon or Jean Jacques Rousseau. From reading this, I found I learned quite a bit, and the prose is beautiful and compulsively readable. But if this were the only history of France one read, one would be hard-pressed to figure out why France matters, how it led the Enlightenment, how it was the pivot of so much European history. Indeed, one would be staggered to learn that France mattered so much in fact as it has. Yet, just reading about Cassini the Third's tremendous effort to map the whole of the Hexagon is a thrilling and moving story, and it's not the only one; the chapter that traces some legends and folktales is wonderful, too. So, love/irritation, because this book's story, and the story of France-in-the-World, seem nearly irreconcilable. Winner of the 2008 Royal Society Ondaatje Prize, an Award given annually to the written work that best evokes the spirit of place. I went from knowing absolutely nothing about the French countryside and history to feeling like I had taken a trip on foot through time in French small towns! However, in the intervening years France has somehow come to be known as a rational, monolinguistic land of art, sophistication, learning, the highest gastronomic achievement and a chic worldliness, all to the delight of tourists. That is, the world has adopted a limited Parisian view of the nation—which, as Robb documents, still deviates from the provincial reality. 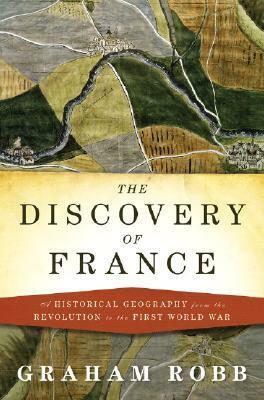 In “The Discovery of France: A Historical Geography from the Revolution to the First World War” (though the book extends beyond those two events), Robb presents a witty and well researched exposé of our misapprehensions about France. That research includes his bicycling some 14,000 miles along the back roads that crisscross the country and “four years in the library” delving into its art, artifacts, folkways, physical history and literature. The result is a compelling portrait of the daily lives of the French before the advent of high-speed trains, superhighways, cinema verité and tourisme. This is a fascinating and thoroughly enjoyable book. We have come to see nation states as monolithic entities, unified by language, culture, and history. Regional variations exist, but appear just as local color. The process of unification was in fact much messier, and bringing order out of chaos, sometimes by economic manipulation, sometimes by force, was a long and fraught process. In the United States we see the strong regional accents fading, and everyone seems to use a kind of homogenized M This is a fascinating and thoroughly enjoyable book. We have come to see nation states as monolithic entities, unified by language, culture, and history. Regional variations exist, but appear just as local color. The process of unification was in fact much messier, and bringing order out of chaos, sometimes by economic manipulation, sometimes by force, was a long and fraught process. In the United States we see the strong regional accents fading, and everyone seems to use a kind of homogenized Midwestern-speak, as if we all grew up in Minnesota. However much the early politicians might have dreamed of unifying all parts of their countries, it was only with the advent of radio, television, and overarching educational policies that it became possible. France’s journey into modernity can be seen as one long process of extending Parisian language and culture to the farthest ends of the country. Considering their starting point, it is not surprising that the job took a century and a half. The hinterlands of France might as well have been not just another country, but from another millennium as well. Since most people never traveled far from their village of birth, it was not surprising that a single day’s journey could take a person to a region where the language, and perhaps the culture and religious practices as well, were completely incomprehensible. France may have been nominally a Christian nation, but away from the cities it was far from orthodox. Out there Christianity was just an overlay on top of ancient pagan beliefs. The book is full of strange and amazing stories largely lost to history. There were dogs that acted like homing pigeons, ferrying packs of smuggled goods back and forth across the borders. There were young children from the rural areas who made long journeys to Paris to work for a few years as professional beggars. Their handlers provided them room and board, gave them some nominal bits of religious education, and allowed them to keep any money they took in over their required daily minimum. There is the reminder that up until a hundred years or so, the vast majority of people living in France did not speak French (meaning Parisian French); some of what was spoken was more or less intelligible, like English and Scottish, and some were entirely different languages. We tend to think of Germany and Italy as emergent nations, only taking shape in the mid nineteenth century, but France was no less fragmented, it just had a central government that outshone all the regional districts. It is clear to me that Robbs with this book wanted to offer a correction on the image that the French put up of themselves as a nation that already in the 18th century laid the foundations of modernity, that during and after the French revolution this modernity penetrated in all sections of French society, and at the same time France spread this light of modernity across the world. This myth has been punctured long ago, not least by French historians themselves, both by the Annales-school as by It is clear to me that Robbs with this book wanted to offer a correction on the image that the French put up of themselves as a nation that already in the 18th century laid the foundations of modernity, that during and after the French revolution this modernity penetrated in all sections of French society, and at the same time France spread this light of modernity across the world. This myth has been punctured long ago, not least by French historians themselves, both by the Annales-school as by the school of social historians in the years 1950 and 1960. But that picture apparently still is not adjusted outside of France. And so Robb can do his thing and show that France in the 19th century and early 20th century was not that unified and centralized and, above all, was not that modern state-of-the-art country it liked to present itself. I have to say: Robb does so with much gusto. He quotes elaborately from travel reports and other ego-documents and astounds us with lots of gasping examples and some surprising photographs. This book is another illustration that the history of little man can offer a very different perspective than that of great personalities and institutions. D'habitude quand vous lisez une histoire de France du XIXème siècle, vous avez droit à un cours sur l'alternance politique entre Empire et restauration puis république et de nouveau une dictature pour finir avec la Commune et la Seconde République. On vous parle de grands hommes, de l'émergence des nationalismes ainsi que d'industrialisation, de colonies et d'avancées technologiques. Dans cette histoire de France, on sort des sentiers battus. On arpente les petits villages où l'on ne parlait pas D'habitude quand vous lisez une histoire de France du XIXème siècle, vous avez droit à un cours sur l'alternance politique entre Empire et restauration puis république et de nouveau une dictature pour finir avec la Commune et la Seconde République. On vous parle de grands hommes, de l'émergence des nationalismes ainsi que d'industrialisation, de colonies et d'avancées technologiques. Dans cette histoire de France, on sort des sentiers battus. On arpente les petits villages où l'on ne parlait pas encore le français. On découvre l'émergence du tourisme thermal dans les Pyrénées. Nous sommes contés les stratégies familiales pour gérer les bouches trop nombreuses dans les régions typiques. On prend connaissance de la découverte d'un pays par un peuple qui n'avait pas les moyens de quitter son canton et qui s'ouvre à la France en l'espace de quelques décennies. Robb's theory, so far as I can see it, turns on the notion that in the process of discovery one eventually knows destruction as well. As soon as an area is mapped, charted, understood by its resources, then there are the people wanting to move to it, use it all up, and charge others to see it. Then, it becomes a politic, and whether it's tourism or daily life, a whole space is lost to what was either found by people looking to expand their reach or some gentle ego wishing to understand better hi Robb's theory, so far as I can see it, turns on the notion that in the process of discovery one eventually knows destruction as well. As soon as an area is mapped, charted, understood by its resources, then there are the people wanting to move to it, use it all up, and charge others to see it. Then, it becomes a politic, and whether it's tourism or daily life, a whole space is lost to what was either found by people looking to expand their reach or some gentle ego wishing to understand better his/her world. This is one of my favorite books ever. It changed the way I viewed history and the way I viewed France. Every page was surprising and exhausting. Did you know they had dog-powered machinery in France? Where the dogs trained other dogs how to use it? That one of the first geographers of France was killed as a sorcerer? That there were orgies in Notre Dame? That Paris has always been a polyglot city, since people from different provinces did not speak the same language? That the government did not This is one of my favorite books ever. It changed the way I viewed history and the way I viewed France. Every page was surprising and exhausting. Did you know they had dog-powered machinery in France? Where the dogs trained other dogs how to use it? That one of the first geographers of France was killed as a sorcerer? That there were orgies in Notre Dame? That Paris has always been a polyglot city, since people from different provinces did not speak the same language? That the government did not know about France's largest canyon until a little before the turn of the century? A beautifully written, important book that covers French history ignored by the Parisian elite. Fantastic. As geographers go, Robb is an excellent writer. The book is fully of interesting anecdotes and is easy to move through. The letdown for me was the organization- it is divided by topics, rather than by region or epoch. Robb mentions a litany of regions and places in France, and describes them with applaudable intimacy. Nevertheless, the reader is left with a mostly undeveloped sense of any one particular place, because he seems to be describing them all at once. Excellent book recommended to me by my BFF Frannie! If you're at all interested in France I would tell you to get and read this book - Aubri, are you listening? I was amazed reading about France. It wasn't anything like I had ever imagined. Thanks for the reference Frannie. My takeaway from this book is that there is more to France than Paris. As true as that is today, it was even more the case in earlier times, when in vast regions people spoke in Basque, Breton, Catalan, Alsatian, Flemish, and other non-French languages and had no concept of living in a country called France. The land was a quilt of a thousand or more pays. Graham Robb chronicles this neither with a sense of nostalgia nor of being a collector of the quaint. Before writing this book, he was already My takeaway from this book is that there is more to France than Paris. As true as that is today, it was even more the case in earlier times, when in vast regions people spoke in Basque, Breton, Catalan, Alsatian, Flemish, and other non-French languages and had no concept of living in a country called France. The land was a quilt of a thousand or more pays. Graham Robb chronicles this neither with a sense of nostalgia nor of being a collector of the quaint. Before writing this book, he was already acclaimed for his biographies of Balzac, Victor Hugo, and Rimbaud. He counted as an expert. His bicycle tours of the countryside revealed to him much he didn’t know. He supplemented the first-hand knowledge his trips gave him with years of research in many libraries and archives. This combination of first-hand observation and digesting hundreds of old guidebooks, maps, and postcards yields the insight that “the more accurate the map, the more misleading the impression” (p. 6). This sentence is an example of his love of tersely antithetical sentences. Here is another: “Even before it was finished, it was clear that the map of France, with its standardized spellings and consistent symbols, would be considerably more coherent than the country itself” (p. 196). At times the narrative threatens to become a collection of oddities, but even then, the reader is sustained by the author’s taut, lively prose. The book is organized more carefully, however, than readily apparent. The first half uncovers a France that has disappeared, the second deals with “forms of life that are more recognizably modern” (p. 138). I especially enjoyed the interlude between parts 1 and 2, on the animal population of France in the 18th and 19th centuries. Merely to conceive of writing such a chapter shows the imagination of the author. An uncategorizable book really and not what I was expecting. I was hoping for a beginniners guide to the geography, people and psyche of France. The blurb on the front seemed to indicate that this is a travelogue by the author, making his slow progress around France on a bike. I incorrectly guessed it would be a bit Bill Bryson. Its much more than that and based more by years in the Library than first hand observations. You can tell how serious the book is, more than a 1/3 is dedicated to footnotes An uncategorizable book really and not what I was expecting. You can tell how serious the book is, more than a 1/3 is dedicated to footnotes and further references/reading. Its organised in chapters that are more about themes than locations or time periods and this results in a meandering voyage but mainly based on C18th to pre world war 1 France. It does a good job of getting beneath the surface of the French and I took quite a bit from it. The size of country and how different the peoples from the south are to the north and east. The removal of Patios speech and adoption of French as a common language. The distributed population. The transport system and how little of the outside world the average French peasant saw. Also more family type learnings - the treatment of the elderly and the very young. "As happy as a corpse" is a phrase I am going to have to try and use. It didn't quite work as well as I hoped, as the regions were just names, rather than providing a clue as to where they are located. Lots of great stuff here--from language to maps to railroads and more, the book tells the story of the various populations "discovering" that they are French, as well as later tourists discovering the France of reality and invention. I loved it! I really enjoyed this book. Honestly at times it was truly boring as hell, but Robb still managed to pull me through with enjoyment the entire way. That's kind of how it felt. Like enjoyably being drug through the mud for a long time. I guess that means the writing was good! Really though, a lot of fun with a lot of great information. Helped that I read it while tramping around France, Give it a go though. I enjoyed it much more than other French historicals. What a wonderful book! I learned soooo much about France. I knew a good deal about the revolution and Napoleon, but that was about it. Now I'm much more interested in learning more. Some good anecdotes, but an example of bad history. Graham Robb is an expert on nineteenth century French literature, noted for his biographies of Victor Hugo, Balzac and Rimbaud. In this, his history of that country in the eighteenth and nineteenth centuries, as France was beginning to discover her nationality, Robb comes to realise he knows less than he should. He says in his introduction: “I began to explore the country on which I was supposed to be an authority… my professional knowledge of the country reflected the metropolitan view of write Graham Robb is an expert on nineteenth century French literature, noted for his biographies of Victor Hugo, Balzac and Rimbaud. In this, his history of that country in the eighteenth and nineteenth centuries, as France was beginning to discover her nationality, Robb comes to realise he knows less than he should. He says in his introduction: “I began to explore the country on which I was supposed to be an authority… my professional knowledge of the country reflected the metropolitan view of writers like Balzac and Baudelaire, for whom the outer boulevards of Paris marked the edge of the civilised world.” This distinction – of a France of the city and a France of the country – becomes clear as the dominant worldview of many learned French as Robb’s history progresses. My knowledge of France, and its history, was, I must admit, limited before reading this fine book. What Robb has managed to achieve is make me fascinated more than ever by France, and also illuminated my understanding of writers such as Balzac – there are details in the classic French novels that made little sense before, and now they ring clear as day. I said earlier that The Discovery of France was a history of that nation in the eighteenth and nineteenth centuries, but Robb ends his work on a pointed note: he refers to the murder of French Algerians in 1961: “On the night of 17 October 1961, thousands of French Algerians protesting peacefully against the curfew that had been imposed on them, were rounded up by the Paris police. Though records have disappeared and though official figures still disagree with scholarly estimates, it is certain that many Algerians were tortured, maimed and stuffed into dustbins, and that about two hundred were beaten up by policeman and thrown into the Seine, where they drowned, in the tourist heart of Paris.” In 2001 a plaque was erected at knee height in memorial to this tragic day, but most Parisians are still unaware of it. He ends his book on this note: “In the twenty first century, many parts of France remain to be discovered.” It is a bitter note to end on, but perfectly encapsulates how far France (and by the same code the world) has come and how far it still has to go; that this journey of discovery is never over. A wonderful book: well-written, spiced with humor, chock full of anecdotes, wide-ranging, eye-opening... and difficult to do justice to in a review. If you peruse other reviews here on Goodreads or on the back-cover of the paperback edition you may be reminded of the elephant as described by the blind men: totally different depending upon which part of the animal they touched. So it is with "The Discovery of France". Depending upon the reviewer it is: a collection of bizarre anecdotes and intere A wonderful book: well-written, spiced with humor, chock full of anecdotes, wide-ranging, eye-opening... and difficult to do justice to in a review. If you peruse other reviews here on Goodreads or on the back-cover of the paperback edition you may be reminded of the elephant as described by the blind men: totally different depending upon which part of the animal they touched. So it is with "The Discovery of France". Depending upon the reviewer it is: a collection of bizarre anecdotes and interesting facts, a narrative of how France became a modern state, a social history, a historical geography, a literary exploration, a biography of France, a travelogue, and so on. So, rather than add another attempt to classify the book I'll just say that is is fascinating, and should be read by anyone who is even vaguely interested in France. o I don't think I've come across a more insightful description of what it was like to live in pre-modern Europe, in which hunger was a constant concern, seasons and geography were paramount, and communications with the world outside one's local collection of villages was limited (and interest in that wider world more limited still). o the contrast between the standard narrative of a centralized France as one of the first European nation states, and the reality of an immense and largely (to Paris) unknown patchwork of micro-regions, with very different life-styles and local cultures largely determined by geography. o how like a tower of Babel the pre-modern world was, with immense language variation over short distances, and the problems that this entailed. For example -- as recently as 1850 one of the major problems the French army had with recruits was mutual incomprehensibility because standard French was the mother tongue for less than half of the citizens of France. o how recent modernity actually is for most of France and the French, and what an immense task it was to standardise things within the country. Language is the most obvious example, but there were regional variations in weights and measures, different towns had different times (Brest was 27 minutes behind Paris! ), in some areas people drove and cycled on the left hand side of the road, in others on the right, and so on and so on. o the immensity of France in the absence of modern transport, and how astoundingly good Roman transport technology was (unsurpassed -- and rarely even approached! -- in Europe until the invention of the railroad). Did you know that in nineteenth century France, most Frenchmen did not speak French? That Fenimore Cooper visited France and found the roads full as bad as the worst in the United States? (Which meant those on the frontier, for the US) He shrewdly observed that the corvee -- enforced labor on the roads -- was generally enforced only when the local noble came by. That at the time of the Reign of Terror most French peasants didn't even know that the king had been executed? A fascinating book, if horr Did you know that in nineteenth century France, most Frenchmen did not speak French? A fascinating book, if horrifying in places. The picture of peasants that it paints is one of dull, narrow-minded, lumpish, churlish clods. Many of them spent the winter months in a kind of torpor. Food was scarce, after all. Many "peasant crafts" were practiced by very few -- if they weren't made up after the fact. In places, its polemic effect -- arguing against the common views that France was, after all, a nation -- seems to overstrain it. The things he's describing he has evidence for, but I'm not sure it bears all the weight he gives it. On the other hand, that might just be that it's unfamiliar to me. And he does have a certain tendency to describe any behavior not explicitly Christian as pagan -- some of the instances he gives are clearly superstitious but not pagan, and others are just behaving badly. The first attempt to map France started in the reign of Louis XIV. It succeeded by seventy years later -- during Napoleon's time -- despite one cartographer being murdered by locals and another being so crippled that he had to retire on a pension. Some of the pictures it paints of the countryside would not be pleasant to run across in a novel. Peasants like this would be No Fun At All. (That's a technical term, there.) I mean, they described brides as foreign, meaning not from outside France, or even outside their province but outside their pays. But some of it would leaven some world-building. This is to French history very much like what British tabloids are to journalism: implicit or explicit generalizations from a collection of out of context senstionalist anecdotes, with a nearly total disregard for established facts and statistics. The main thrust of this book is that the French are not French but a collection of isolated tiny tribes (the word "tribe" itself is repeated over and over again, occurring a good thirty times in the text) of violent, illiterate and dirty peasants, nearl This is to French history very much like what British tabloids are to journalism: implicit or explicit generalizations from a collection of out of context senstionalist anecdotes, with a nearly total disregard for established facts and statistics. The main thrust of this book is that the French are not French but a collection of isolated tiny tribes (the word "tribe" itself is repeated over and over again, occurring a good thirty times in the text) of violent, illiterate and dirty peasants, nearly none of which spoke French. To anyone that has even remotely studied the European Middle Ages, this "tribal" thesis is utter nonsense, as the main action of the Church in the dark ages, which indeed founded European civilization, was the break-up of tribal ties via the interdiction of marrying one's cousins, even remote ones. In the ninth century, the Church even went as far as prohibiting weddings between seven times removed cousins. Waves of Germanic and other Eastern invaders were thus assimilated and tribes made way for families, which did not hinder the rise of modern states as tribes would have. He won the 1997 Whitbread Book Award for best biography (Victor Hugo) and was shortlisted for the Samuel Johnson Prize for Rimbau Graham Macdonald Robb FRSL (born June 2, 1958) is a British author.